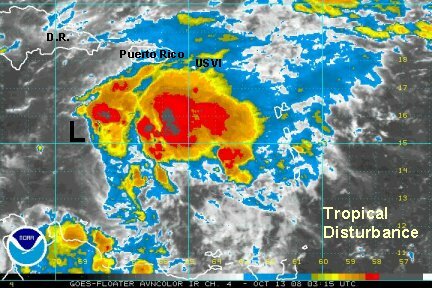 A tropical disturbance is centered at 15.3 N 69.1 W or about 300 miles southwest of San Juan, P.R.. Satellite imagery shows that a surface low has formed and appears to be moving west. Deep convection is producing heavy rain east of the low center, especially south of Puerto Rico. Forecast models develop the low some and move in north toward the Mona passage. We're not sure if this is a good solution yet. Southwesterly wind shear is keeping the deep convection east. If this continues the low may never develop. The next 24 hours will be critical if this low is going to organize. Last edited by Caribbean Traveler on Tue Oct 14, 2008 3:08 pm, edited 1 time in total. 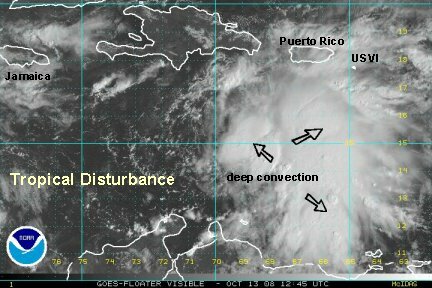 The apparent low center noted last night about 300 miles ssw of San Juan appears to be drifting southwest and dissipating. At this time deep convection looks very impressive, but no surface low has developed yet. It's possible that a new low center may try to develop farther east under that cluster. Heavy rain causing flash flooding and mudslides is a real threat in Puerto Rico. Right now, the heaviest rain is in the eastern half of the country. The Hurricane Hunters may check this system out this afternoon. A large area of heavy rain continues south of Puerto Rico by about 300 miles. Flash flooding and mudslides will be a concern for Puerto Rico over the next few days as this system slowly moves toward Puerto Rico. Rainfall of 5-10" may be expected. The Hurricane Hunters are now investigating. A Hurricane Hunter was investigating and sent back a vortex mesage from just before 9 pm edt. Surface winds were estimated at 37 knots and flight level a little weaker. As we mentioned in the earlier update, this is almost a tropical storm. In fact with the lastest satellite imagery, we think that the National Hurricane Center may name it at 5 am edt. Very heavy convection has drifted south and is near Aruba, Bon Aire and Curacao. These are usually dry locations. The models still take this northward toward Puerto Rico in a couple of days. Threre is the threat of heavy rain with 10'+ of rainfall. Aruba, Bon Aire and Curacao have all reported rain and storms, sometimes heavy over the past six hours. These are usually dry islands and this is not a common occurance. T.D. 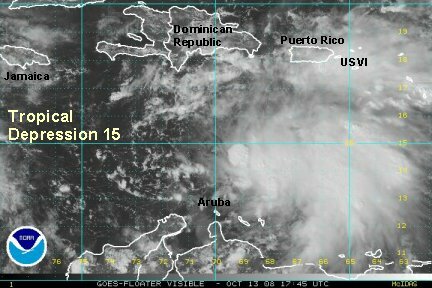 15 is still in the middle of the eastern Caribbean and is slowly, but surely organizing. 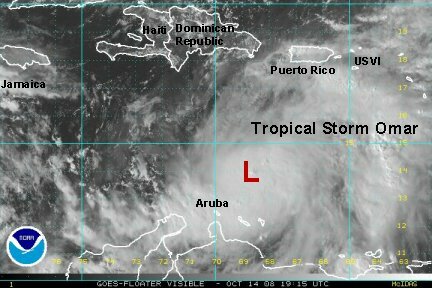 The Hurricane Hunters will be investigating early this afternoon. We think that there is a good chance that it will be upgraded to a tropical storm today. The forecast has not changed much. The tropical depression should start moving northeast toward the USVI and Puerto Rico in the next couple of days as it strengthens. Omar is now organizing and deep convection continues to build near Aruba northeast across the eastern Caribbean to the Leewards. 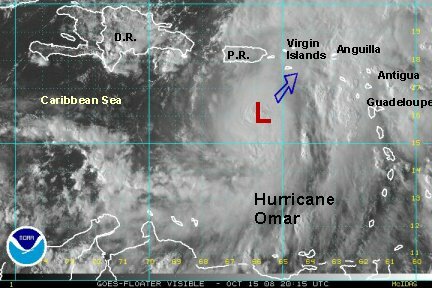 Omar will start moving northeast which will take it near eastern Puerto Rico and the Virgin Islands. 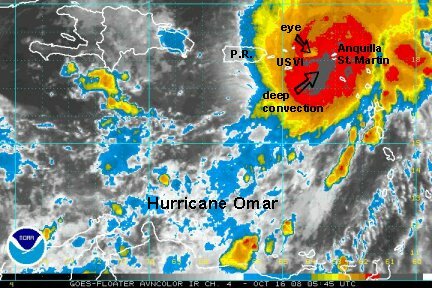 It is not out of the question that Omar could become a hurricane before reaching the Virgin Islands. The late Wednesday into early Thursday will be the time of most concern. NHC estimated winds at 50 mph on the last advisory. This seems reasonable and it may be a touch stronger at this time. Tropical storm Omar continues to organize and is almost a hurricane. NHC has 70 mph winds. This looks close. An eye may become visible soon on the satellite imagery. 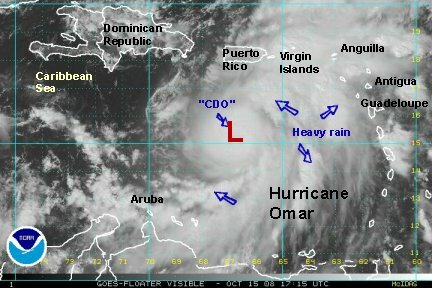 Omar is definitey moving northeast now, and the worst of the effects should be near Puerto Rico and the Virgin Islands Wednesday night. Residents of Puerto Rico eastward to the Leewards should prepare for heavy rain and strong gusty winds. Eastern Puerto Rico, St Thomas, St Croix, St John into the BVI will see the worst of what will likely be a hurricane - possibly a cat 2 (95-110 mph). Conditions will get worse rapidly during the day Wednesday. Omar was officially upgraded to a 75 mph hurricane at 11 pm edt. This looks like a reasonable estimate. Satellite imagery shows that an eye is trying to become visible, but is still not quite there yet. We expect additional strengthening as Omar should be over the Virgin Islands in about 24 hours - Wednesday night. A buoy in the eastern Caribbean Sea north of Omar recently measured a sea to 15'. Seas have been increasing rapidly over the past few hours. 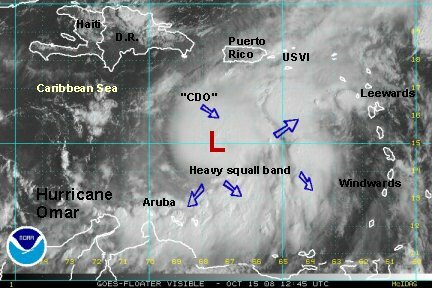 Look for large swell to affect the south coasts of the northern Caribbean Islands and west shores of the Windwards and Leewards. Aruba, Bonaire, and Curacao have experienced heavy rain and storms over the past 24 hours. Aruba reported eight hours of heavy rain, but did not give a rain total. A rain total of 2.65" was measured in Curacao or the 24 hour period ending at 8 pm Tuesday night. 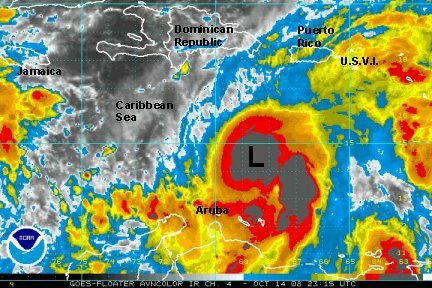 Residents of Puerto Rico eastward to the Leewards should prepare for heavy rain and strong gusty winds and power outages. Puerto Rico, St Thomas, St Croix, St John into the BVI will see the worst of the conditions - possibly a cat 2 (95-110 mph) hurricane. Conditions will get worse rapidly during the day Wednesday. Please let us know how weather conditions are where you are. Send your replys to our "Eye of the Storm" thread - Island Reports! 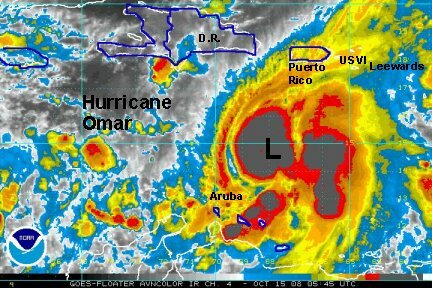 We'd love to hear from our patons from the Puerto Rico, Aruba, the Virgin Islands, or any other location being affected by Omar. After studying the first visible satellite images, it appears that Hurricane Omar's strength has not changed much. This is backed up by last night's recon. This may change today though. Last night, there were two distinct banding structures. Today one massive area of cloud covers the center of the low (CDO). The eye was trying to become visible last night. If it does appear today, Omar may make a strengthening run. At this time, we're expecting a slow strengthening as it heads through the northern Caribbean Islands. As mentioned on our last advisory, Omar may be a cat 2 hurricane as it moves through the Virgin Islands tonight. Right now the area of hurricane force winds is very small. A buoy not too far from the center of Omar has reported seas to 18' and winds gusting to 70 mph. Heavy rain and thunder is still being reported near Aruba, Bonaire and Curacao. The band of unsettled weather is bringing a solid area of rain into the the Virgin Islands as depicted on radar. The Hurricane Hunters found stronger winds so the National Hurricane Center upped the winds to 85 mph. We think that this is a touch high. The hurricane force winds only extend 15 miles from the center of circulation, so Omar is a small hurricane at this point. 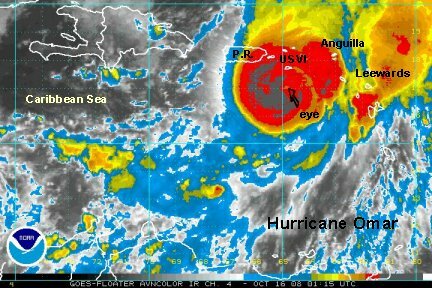 Satellite imagery showed briefly an opening in the eye. It's possible that this was a "sucker hole" or a small amount of dry air entrained into the circulation that has the appearance of an eye. The outflow aloft is being restricted by westerly winds bringing in some dry air. Cloud tops are actually warming some - an indication of some weakening. Right now we'll say that Omar is holding onto minimal hurricane strength with winds 75-80 mph. The satellite also shows what appears to be a jog farther eastward. The forecast models all insist on taking Omar through the Virgin Islands tonight. Be prepared father east toward Dominica and Guadeloupe. If there is any movement east, it will increase effects toward all of the Leewards. Residents of Puerto Rico eastward to the Leewards should prepare for heavy rain and strong gusty winds and power outages. The Virgin Islands eastward to the northwestern Leewards looks to see the worst of the conditions - possibly a cat 2 (95-110 mph) hurricane. Conditions will get worse rapidly during the day today. Hurricane Omar has stopped its eastward jog from earlier today and is resuming its course into the Virgin Islands and northwest Leewards. A recent Hurricane Hunter estimated the top sustained surface winds at 80 knots or 92 mph. The recon from a half an hour ago measured a 969 mb pressure which is down 4 mb from the NHC advisory at 5 pm ast (edt). With this being the case, it appears that Omar is strengthening fairly quickly and we expect Omar to be a cat 2 hurricane as it moves through the Virgin Islands and Leewards tonight. Right now, our estimate of top sustained surface winds is 95 mph. The path will take the center of Omar just near or east of St Croix in several hours and near or just west of Anquilla early Thursday morning. Residents of Puerto Rico eastward to the Leewards should prepare for heavy rain and strong gusty winds and power outages. The Virgin Islands eastward to the northwestern Leewards looks to see the worst of the conditions - possibly a cat 2 (95-110 mph) hurricane. Conditions will get worse rapidly during the day today and into tonight. Hurricane Omar's strengthening phase has leveled off for now. Pressure is back to 971 mb. Top sustained winds are 105 mph. 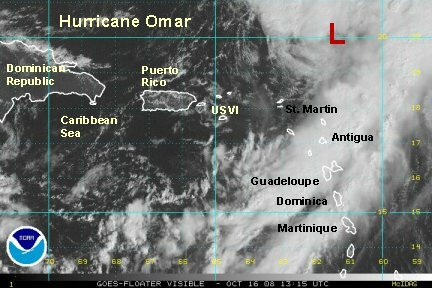 Omar is centered near 17.1 N / 64.8 W or about 50 miles south of St. Croix / 135 miles sw of Anguilla. It is moving northeast at 17 mph. The latest radar indicates that Hurricane Omar is on track to move just east of St. Croix then near or just west of Anguilla later tonight. The western eyewall will come very close to eastern St. Croix shortly. The last report indicated northeast winds at 40 mph. Omar continues to stay very strong at 125 mph. 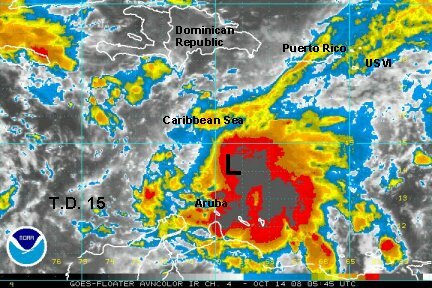 It is centered at 18.5 N / 63.8W or about 55 miles northwest of St. Martin. Pressure has dropped to 959 mb. Hurricane Omar continues to race northeast at 20 mph. It has now bypassed St Croix, where the conditions are improving rapidly. The eye wall was barely east of the island. 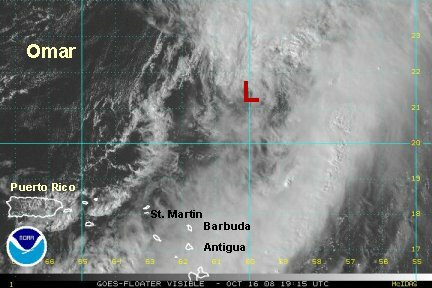 It is now northwest of St Martin and Anquilla. Strong winds and heavy rain will be battering those islands over the next few hours. 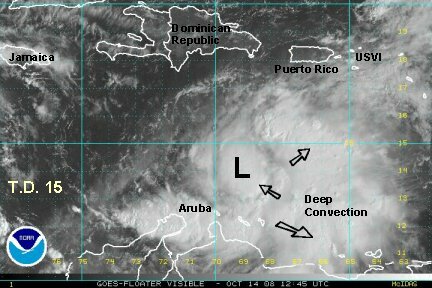 keep in mind that the west facing beaches of the Lesser Antillies, especially the Leewards will be prone to large swell. This is opposite of a "normal" hurricane that would approach from the east. Hurricane Omar will move into the Atlantic this morning and move rapidly northeast ahead of a large upper low. It will accelerate into the open Atlantic well east of Bermuda and eventually be sheared and loose its tropical characteristics in a few days. Omar is centered near 20.0 N / 61.6 N or about 165 miles northeast of St Martin. It is moving northeast at 30 mph. Satellite imagery shows that some dry air is wrapping into the circulation on the south side. Because of this we think that the top sustained winds are now closer to 100 mph, down from 115. A couple of rain bands extend into the Lesser Antilles and heavy rain of 1-3" may be expected with the squalls. Winds may gust 25-35 mph in the squalls. Omar is centered near 21.5 N / 61.6 N or about 290 miles northeast of the Leewards. It is moving northeast at 25 mph. Strong wind shear is exposing the circulation and has disrupted the convection near the center. We think that Omar is rapidly weakening and now a tropical storm of about 55 mph. It is starting to look more like a mid latitude system and should become extratropical in the next 24-36 hours. We strongly disagree with NHC's assessment of it still being a 70 knots hurricane at 8 pm ast tonight. We think that NHC will make major changes to their forecast.